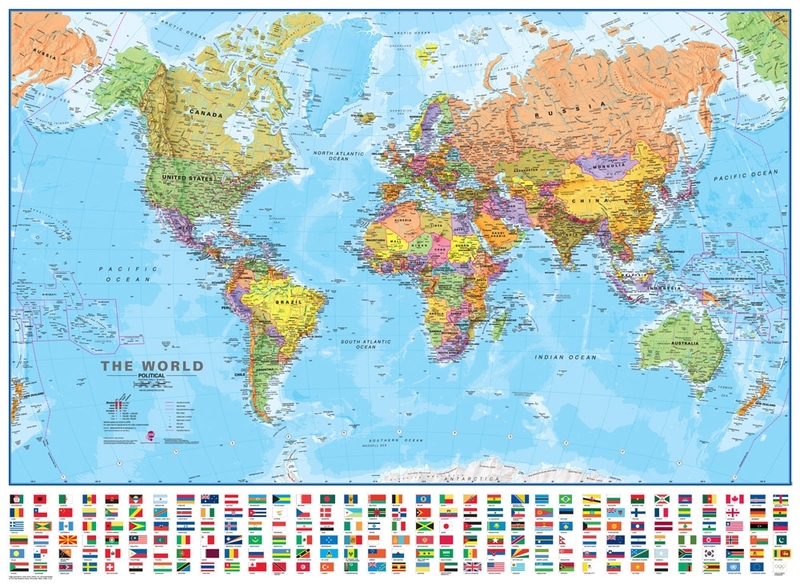 Map Dimensions: 39 inches tall x 54 inches wide. Click here for more detail. This world map is similar to the inexpensive Blue Ocean World Wall Map, but it is MUCH more detailed. The printing on this map is more finely done, allowing many more place names and much more detail in the shaded relief rendering of the world's physical features. There are different symbols to represent cities by population as well as designate regional and national capitals. You will find markers to show notable mountains and the highest peaks of countries and continents. There are also numerous markers showing ocean depth, and clocks to indicate time zones of the world. If you want more detail on culture and physical features, this is the map. There are more cities shown, and more rivers, lakes, and islands are labeled. This map represents the world at a 1:30,000,000 scale with a Van der Grinten projection. The lamination is thick, sturdy plastic.